Smolyan mountain city and hotels in Bulgaria. 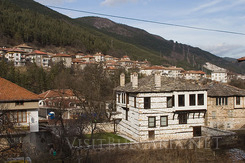 Smolyan is one of most beautiful Bulgarian cities. It is situated in Central South Bulgaria in the most picturesque part of the Rodope Mountain in the narrow valley of Cherna River, 850 - 1050 meters above the sea level. 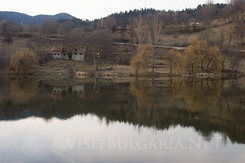 It is situated on 250 km southeast of Sofia, 103 km south of Plovdiv and just 16 km south of the winter resort Plovdiv. History: Smolyan becomes a town in 1960, after the uniting of three villages: Smolyan, Raykovo and Ustovo, now neighborhoods in the town. The highest one - Smolyan, rises on the place of the Ezerovo village, among the Smolyan lakes. During the period of Ottoman rule, the locals were forced to accept the Muslim faith, XVII century; its inhibitors rendered a strong resistance. That is why the village was devastated. Those people who accepted the Muslim religion settled down along the valley. The village was called Pashmakla. After the liberation it was renamed to Smolyan, after the Slavic tribe smolyani, who inhabited those lands daring the medieval period. According to the legend Raykovo village emerges because of its geographic situation. It is the lowest village at the mouth of the river. During the epoch of the Revival period crafts flourish in the three villages. Sightseeing: Many well preserved houses from the revival period can be seen in all three neighbourhoods. They are cultural monuments. The arch bridge (Beiska Kapia) is situated in Smolyan, over the Cherna (Black) River. It was constructed in the beginning of the XVIII century. The biggest planetarium is also in the city. The natural Park “Chinara”, the Rodope historical museum, with more than 150 000 exponents and city art gallery are in the city. 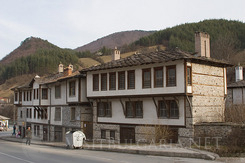 Raikovo neighbourhood hosts Pangalovata house – a valuable architectural monument of culture from 1860, Alibeev konak (town- hall) – old residential and economic complex, the monument tomb of the residents, who scarified their lives for the freedom of Raykovo, the church “st. Nedelya” (1836) with marvelous icon paintings and Mazolevata cheshma, with writings dating back to 1572, the first source of information for the settlement. 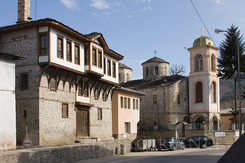 Ustovo neighbourhood also has remarkable landmarks, like the Mednikarski market, the Church St. Nikola, with rich wall paintings and original architecture and many houses in traditional style. The Russian troops stayed in Hadjiivanovata house, during the liberation war. The modern centre of the town really fascinates the visitor. The city centre architecture corresponds to the local environment and the traditions of the town. Vicinity: The Smolyan lakes are known as “The emerald eyes of the Rodope Mountains”, are situated just 3 km away from the city. The 20 meters high Smolyan waterfall on Kriva River is also nearby the town. Pamporovo winter resort is just 10 km away from the city. Close to the city, more than 20 caves can be explored. The most fascinating cave is Ultsata, because of its remarkable cascade lakes. 10 km north of Smolyan, Momchilovtsi village is situated. It offers mild and pleasant climate and unique architecture, breathtaking nature and numerous small and cosy family hotels. South of the town right on the Kainasina rodope ridge stands “st. Atanas” monastery and the legendary Kraliov stone peak. Where to stay? 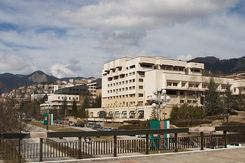 Smolyan is a town with traditions in the tourism industry. Numerous luxurious and small family hotels welcome tourists and are ready to meet all their needs. Read more about the natural beautiful sightseeing spots and caves of Smolyan Region, here!